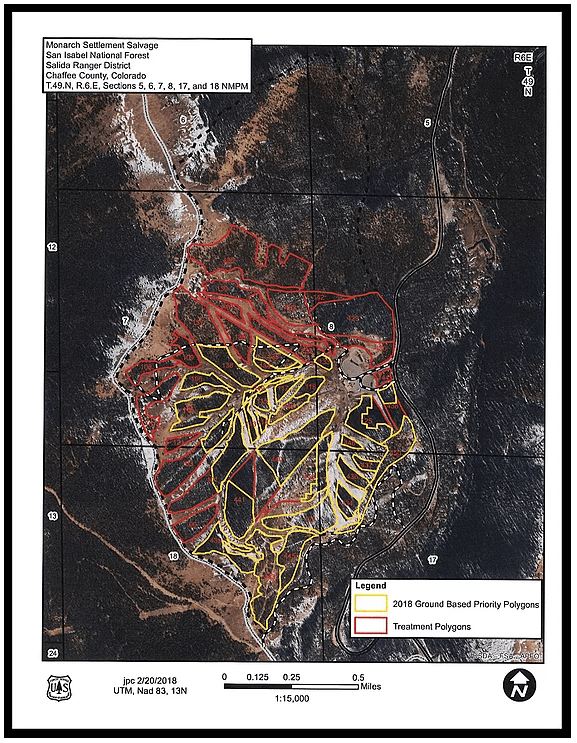 The first phase of the 5-year Monarch Pass Vegetation Management Project aims to treat the yellow priority polygons shown below. While this initial effort will not cover the entirety of these areas, work is on track for the majority of these polygons to receive some type of treatment. All of these zones are located within the ski area boundary on somewhat lower angle terrain where the timber can be removed without the use of winch assisted machinery or helicopters. US Highway 50 can be seen running from top to bottom on the right side of the polygons. The yellow polygons on the lower right-hand side are located along Gunbarrel Ridge adjacent to Old Monarch Pass Road. Central areas being treated include the Lower No Name trees and the Ajax runout. The Sleepy Hollow corridor down towards the Tumbelina Lift and the lower Panorama basin will comprise the rest of the main objectives for this initial effort.